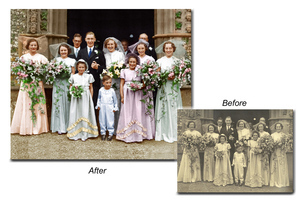 Print to Print services allow for the copying of photographs from the original to any size required, no retouching is included in this service although we will use enhancement on the finished prints to make the most of the copying process to eliminate some fading and colour loss. Restoration Services are available costing from £5 to £25 depending on how severe the damage is on the original. We give a free estimate for the work to be carried out before taking instruction to proceed with the order. We do not restore the original print rather a copy of it using the most advanced techniques available. To use this service please send your damaged photograph together with a complete list of instructions listed on an order form. We will keep you advised of the whole process throughout giving an estimate in the first instance. Upon your acceptance of the quotation the work will be completed and the finished work will be sent to you. All retouching work can be altered so if you are unhappy with any part of the work provided it will be redone without charge to your satisfaction.